This Series, in seven parts, tells the story of America from the earliest founding through the days of Woodrow Wilson and The Great War (World War I). In Part 5, you'll hear stories of explorers and pioneers. Henrietta Elizabeth Marshall (1867 - 1941) was a British author, most famous for her works of history for children. For decades, Marshall's books were ubiquitous in schools and home libraries. Much of the popularity of her works stems from her talent for making history read like good storytelling. I just love a good story. A well-told story that's also true (i.e. history) is even better! H.E. Marshall, the author of This Country of Ours and other history books for young people, was a gifted storyteller with a passion for her subject. Her writing, though full of historical events, dates, and facts, is never dull nor dry, being a series of stories about individuals and the events they shaped or found themselves caught up in. Alcazar Audioworks has undertaken to make this book available on CD, unabridged, but divided into eight parts. This makes it easier to buy just the chapters I need for our current history studies, which helps our homeschool budget. To get an idea of the book, look for it online as a free e-text. I read aloud from the e-book, as a matter of fact, our first time through this book, before Alcazar's audiobooks were available. Now that our younger set has begun to study American history, we're going through the book again, this time listening together to the audiobook. I like the fact that we can be folding laundry or washing dishes while doing our history reading! The readings are divided into tracks, making it easy to break up the reading and have the listeners tell back (or narrate) what they've heard. 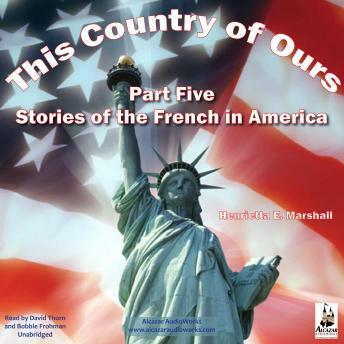 Part Five: Stories of the French in America is comprised of chapters 45 to 50 in the book. Coming from the Midwest, I was taught about LaSalle, Joliet, and Marquette in school. However, This Country of Ours is full of interesting stories and anecdotes that I don't remember ever hearing from the standard history textbooks! You'll find here not only a great deal of detail about the exploits of LaSalle, but also struggle between the French and the British over who would control the new territory, the pride and folly of the British general Braddock (and appearances by a young George Washington), the eventual victory of Britain over France, and Chief Pontiac's attempt to destroy the British forts and drive the invading English from the land. There are bold explorers and mutinous men, pitiless massacres and determined battles, foolish pride versus wisdom, treachery and acts of friendship. One more note of caution: As This Country of Ours was published in 1917, it does not meet today's standards of political correctness. What we now call ""Native Americans"" are termed ""Indians"" or ""Redmen"" or even ""savages,"" for example. We use this sort of reference as a jumping off place for discussion. In any event, the author is not one to gloss over the failings of the Europeans in this history, laying out in painstaking detail flaws, as well as heroic deeds on the part of all the participants in the telling. The author draws from original sources such as journals and letters, and history is neither romanticized nor sanitized for the modern student. Some of the material was too graphic for our more sensitive listeners, and so our students who were going through this material in their history studies had to listen with earphones. This Country of Ours is one of the books used in the Ambleside Online curriculum. The sets correspond to the divisions within the book, rather than Ambleside Online years. However, it is not difficult to figure out which set(s) are needed, if you compare the chapter listings on Alcazar's and Ambleside's websites. Whether or not you are using Ambleside Online's reading list, you'll find This Country of Ours a fascinating look at early American History, especially if you live in one of the states featured in the stories. Highly recommended.